Britt and I have a tradition of tye dying almost every year. 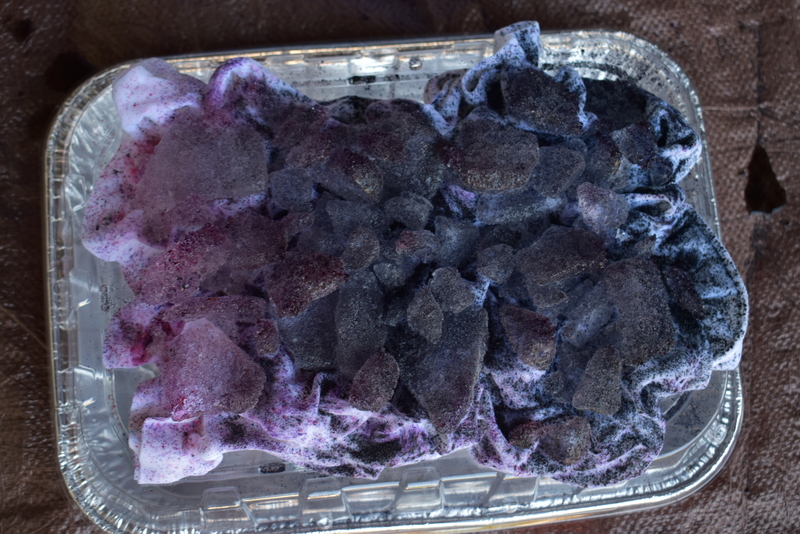 This summer we decided to attempt it at Britt’s apartment… Instead of doing pots of dye on the stove or in buckets outside, we discovered ice dying, which was a new technique for us. We decided to try it out and see if it was more suitable for apartment-sized crafting than our usual dying method. With our new found inspiration, we set out to see how big of a mess we could make in Brit’s car port. 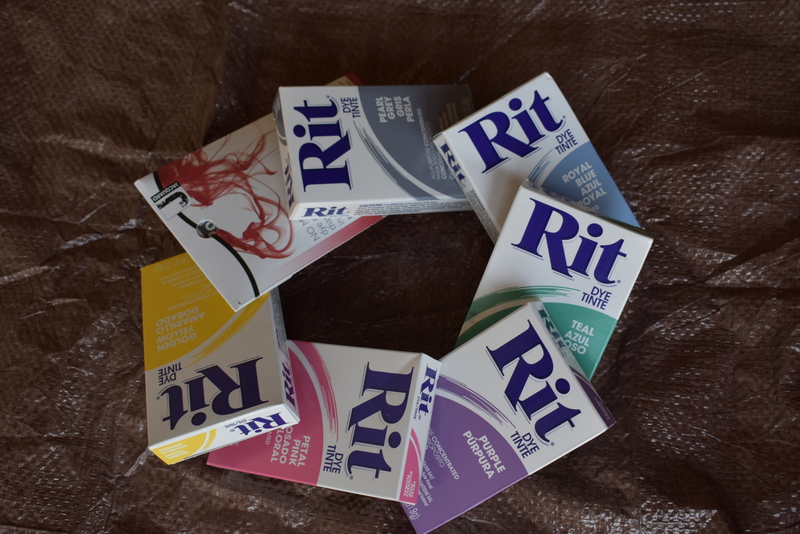 Ruber bands (You only need these if you want to do starbursts or to tie up the fabric to produce a certain pattern). We started by dissolving a package of soda ash in a couple of gallons of water. The package of soda ash should say how much to add for water volume. 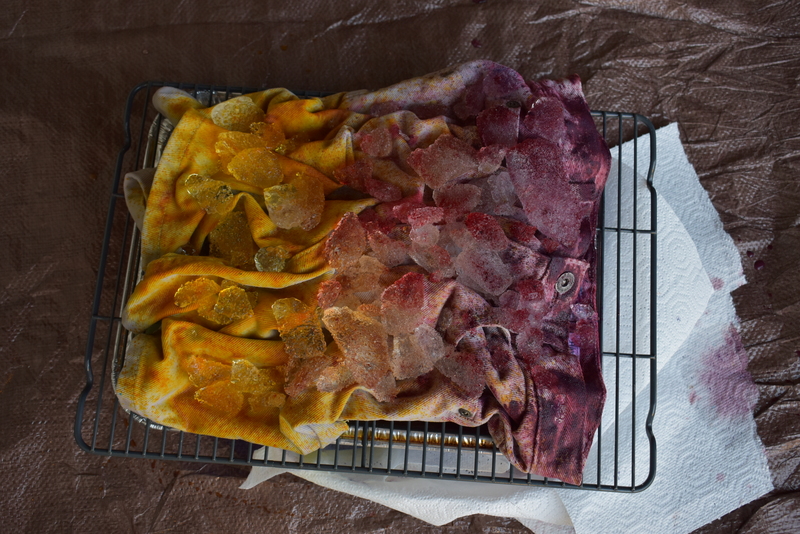 Then for an hour, we soaked the clothing and fabric in soda ash as a fixative for the dye. 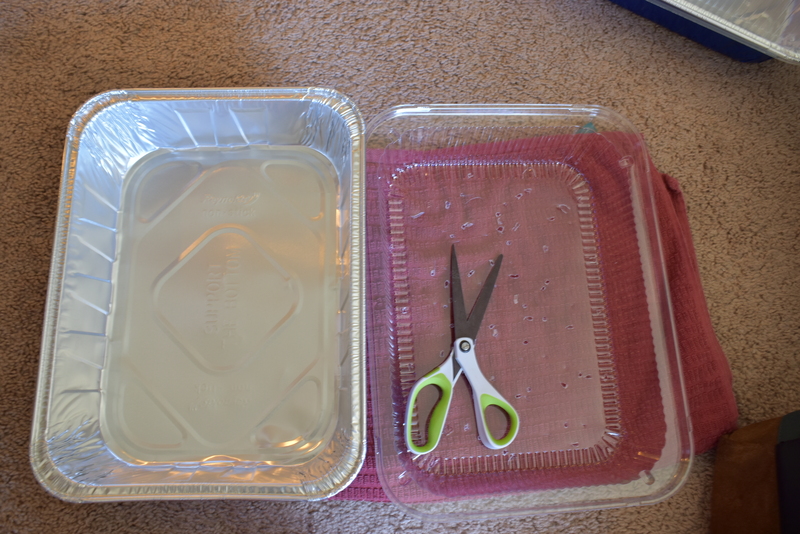 We used scissors to poke holes into the plastic lid that accompanied the tin pans. This allows water to drain into the tin pan as the ice melts. 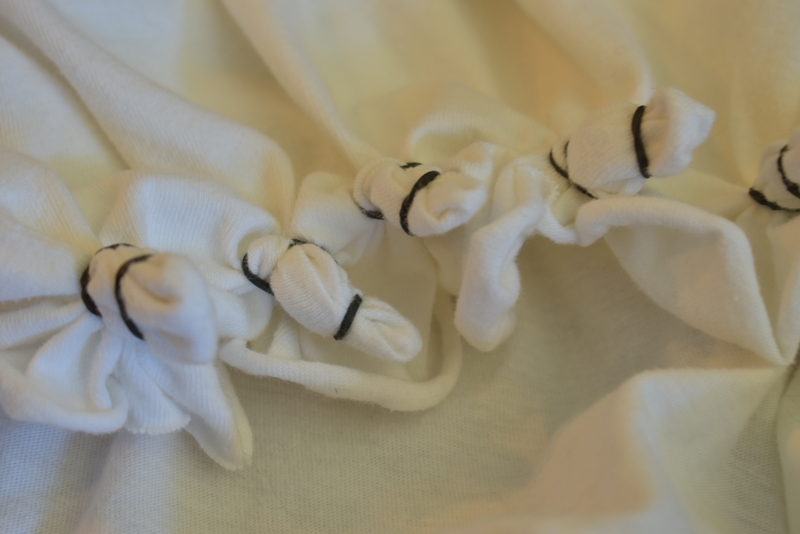 I love starbursts so I used tiny hair rubber bands to create them around the bottom of some shirts I was dying. We placed the plastic lids on the tin pans. The we put cookie racks over the tin pans that didn’t have lids. The red package of polyester dye did not work! 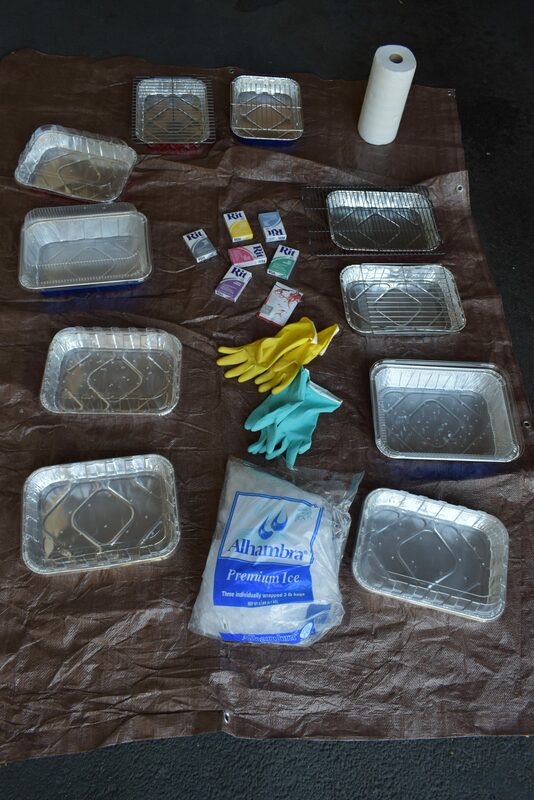 Step 6: Arrange fabric and add ice. We used one bag of store bought ice. When I ice dyed sheets a few weeks later, I needed a lot more. When in doubt, just get more ice! Step 7: It’s time to dye. We opened the packages of dye and shook the powder onto the ice. There isn’t really a specific method for this part, have fun! We ended up leaving the ice to melt over night. 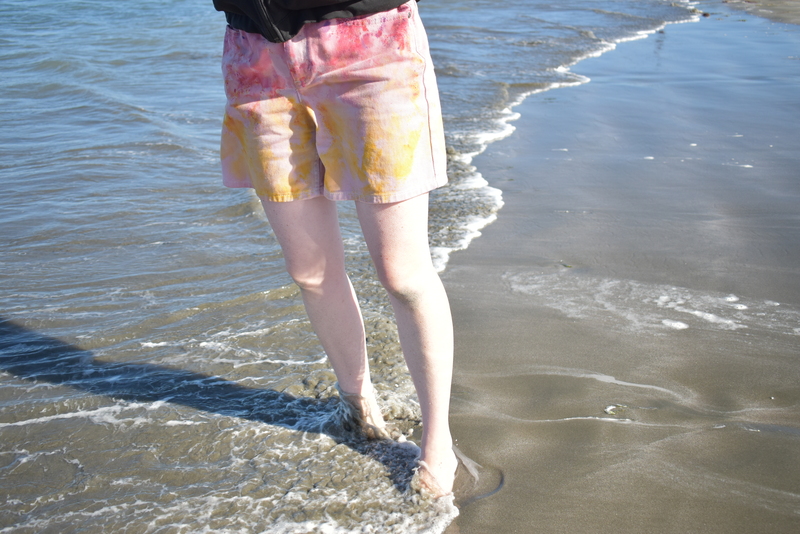 When I dyed sheets back at home a few weeks later, I left the dye sitting for 3 hours. 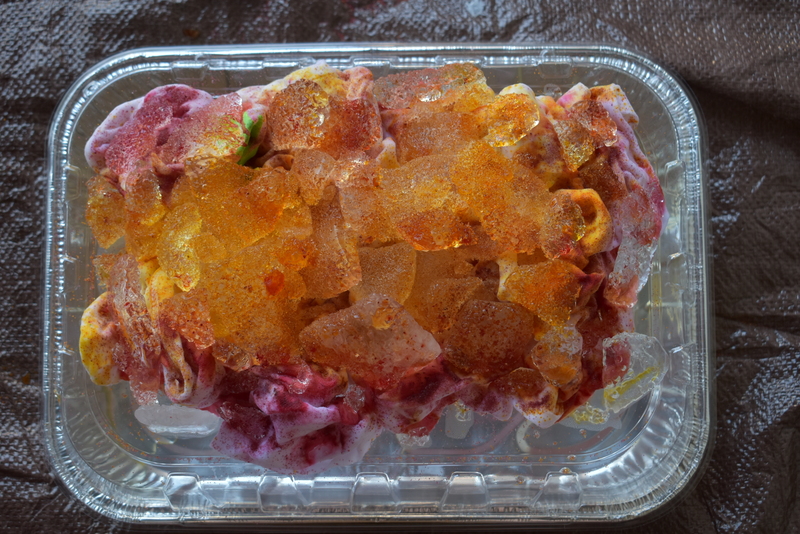 In the morning we collected our ice dyed goodies from the car port and put them in the wash. 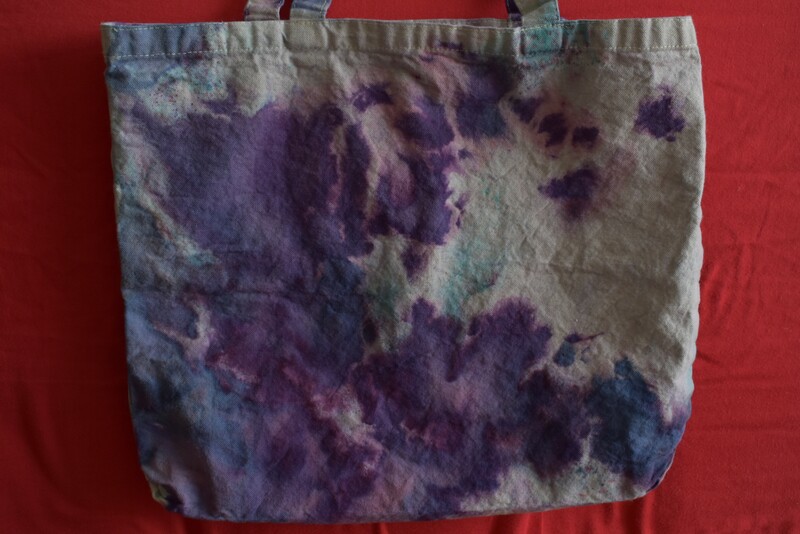 The dye had a harder time melting through and getting both side of thicker material like the tote bags and a pair of shorts. Still turned out pretty cool but it is something to take note of. 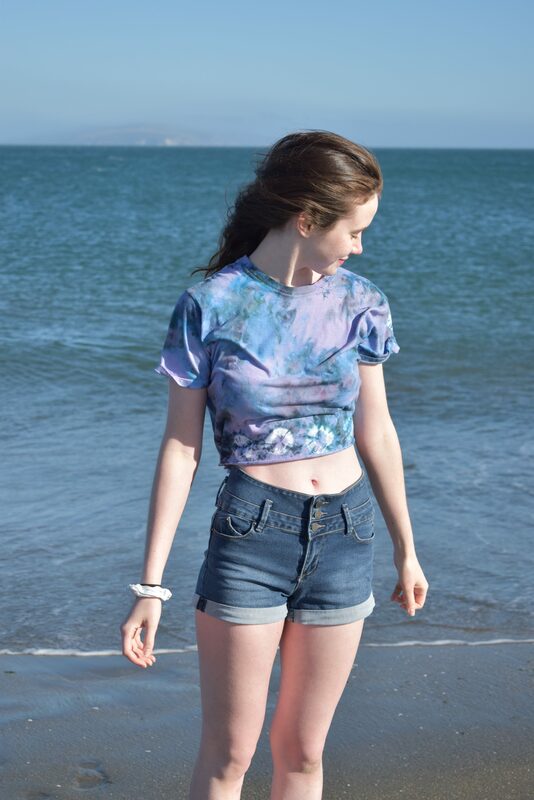 We hit the beach rocking our new ice dyed clothing! We fit right in at Brit’s local market. We washed the tin pans and cookie racks in the bathtub so I could take them home and do some ice dying with my friends! (The dye water dyed the soap scum in the tub, but did not dye the actual tub because we scrubbed it clean as soon as possible. Your tub might retain dye if it is old and/or cracked. If in doubt, you can do this step outside.) We used a hose outside to wash the tarp. Relatively easy and quick clean up!